Duration: 2 mins, 4 sec. Tranquil interlude previously titled 'Interlude 2'. 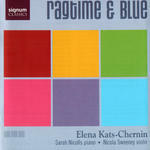 CD: Ragtime & blue / Elena Kats-Chernin.